Tabula Asiae VII. 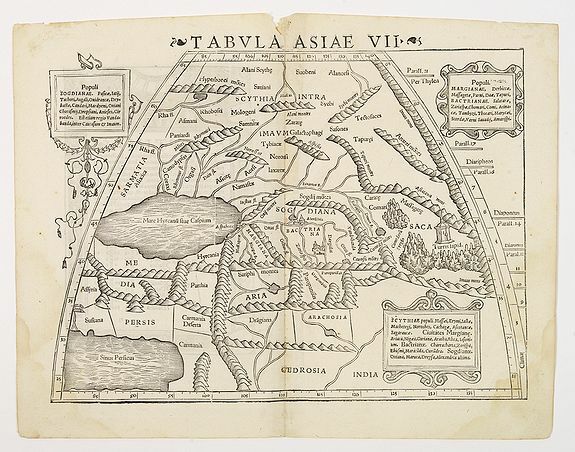 [Central Asia and Russia] - MÜNSTER, S.
Title : Tabula Asiae VII. [Central Asia and Russia]. Size : 9.8 x 13.4 inches. / 25.0 x 34.0 cm. Description :Wood block printed map with letter press on verso. A Ptolemaic map of the region north and east of the Black Sea and Caspian Sea, extending to the Imaus Mountains. Münster's "Geografica" and "Cosmographia" are one of the most influential geographical works of the 16th Century. Published in a number of editions over a half century and was continuously revised and updated to include new illustrations and updated information. Condition : Paper slightly age toned, water stains in lower right and left corner. Good condition and dark impression.